Completely water proof and 2000 user capacity. Vandal resistance with metal construction. This works with all of our Automatic Gate Openers. Inbuilt RFID reader for swipe cards and tags. Completely water proof and 1200 user capacity. Two relay output. Vandal resistance with metal construction. This works with all of our Automatic Gate Openers. Gate can be full open or half open with different PIN numbers. 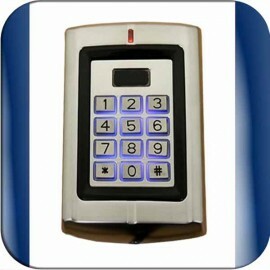 This is a wireless Keypad work with Centurion gate openers. Also work with RECT5 Receiver. Power is supplied by inside battery. Easy installation as there is no wiring. 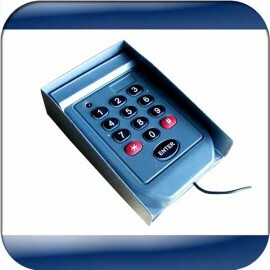 This is a Wireless Keypad comes with matching Receiver Unit. Power is supplied by inside 3V CR2450 battery. Easy installation as there is no wiring. Built-in Proximity Card Reader. Water Proof plastic construction. Open the gate with 6 digit pin code. Two proximity cards and two proximity tags included. Just connect the wires to the gate opener. Keypad is plastic construction comes with nice weather guard. This has built-in Proximity Card Reader. This is a wireless Keypad work with SWD4 Double Swing Gate Opener and SWS4 Single Swing Gate Opener. Power is supplied by batteries. Easy installation. Centurion Brand rain shield. Use with Centurion Keypad. Rain shield is made out of Stainless Steel.